Recorded on May 8, 1973, on the shores of the Pacific Ocean, near Los Angeles. PRABHUPADA: Natural phenomena such as the law of gravity or weightlessness are achintya-shakti, inconceivable energies, and real science means to understand this achintya-shakti. To observe a chain of events only from a certain point in time is unscientific and gives only incomplete knowledge. We must know where things begin. If we carry our investigation far enough, we will find that the origin of nature is achintya-shakti. For example, with brain, brush and color we can paint a flower. But we cannot conceive how vegetation throughout the whole earth is automatically growing and fructifying. We can explain the painted flower, but we cannot explain the real flower. Scientists actually cannot explain biological growth. They simply juggle words like molecule and chromosome, but they cannot actually explain the phenomena. The essential fault of the so-called scientists is that they have adopted the inductive process to arrive at their conclusions. For example, if a scientist wants to determine by the inductive process whether or not man is mortal, he must study every man to try to discover if some or one of them may be immortal. The scientist says, “I cannot accept the proposition that all men are mortal. There may be some men who are immortal. I have not yet seen every man. Therefore how can I accept that man is mortal?” This is called the inductive process. And the deductive process means that your father, your teacher or your guru says that man is mortal, and you accept it. PRABHUPADA: Yes. The ascending process will never be successful, because it relies on the information gathered through the senses, and the senses are imperfect. So we accept the descending process. God cannot be known by the inductive process. Therefore He is called adhokñaja, which means “unknowable by direct perception.” The scientists say there is no God because they are trying to understand Him by direct perception. But He is adhokshaja! Therefore, the scientists are ignorant of God because they are missing the method of knowing Him. In order to understand transcendental science, one must approach a bona fide spiritual master, hear from him submissively and render service to him. Lord Krishna explains that in the Bhagavad-gita (4.34): tad viddhi pranipatena pariprashnena sevaya. PRABHUPADA: The law is cheating, medical science is cheating, and the government is cheating. Top government officials are charged with taking bribes. If the governor takes bribes and the constable takes bribes, then where is the good society? People elect the leader who promises them happiness. But since that happiness is maya [or illusion], he can never deliver it, and society simply becomes filled with cheaters. Since people are actually after this illusory happiness, however, they continue to elect such unscrupulous leaders time and time again. The position of a Vaishnava  is to take compassion on all these ignorant people. The great Vaishnava Prahlada Maharaja once prayed to the Lord, “My Lord, as far as I am concerned, I have no problems. My consciousness is always absorbed in Your very powerful transcendental activities, and therefore I have understood things clearly. But I am deeply concerned for these rascals who are engaged in activities for illusory happiness.” A Vaishnava thinks only about how people can become happy. He knows that they are vainly searching after something that will never come to be. For fifty or sixty years people search after illusory happiness, but then they must die without completing the work and without knowing what will happen after death. Actually, their position is like that of an animal, because an animal also does not know what happens to him after death. The animal does not know the value of life, nor why he has come here. By the influence of maya, he simply eats, sleeps, mates, defends and dies. That’s all. Throughout their lives the ignorant animals—and the animalistic men—greatly endeavor to do these five things only: eat, sleep, mate, defend and die. Therefore the business of a Vaishnava is to instruct people that God exists, that we are His servants, and that we can enjoy an eternally blissful life serving Him and developing our love for Him. DR. SINGH: But doesn’t the living entity need matter as long as he is in material nature? PRABHUPADA: No, the living entity is purely spiritual; therefore, he doesn’t require matter. Because his thinking is diseased, however, he believes he does. The conditioned living entity is like a drunkard who doesn’t require drinking, but who nevertheless thinks, “Without drinking, I shall die.” This is called maya, or illusion. Is it true that if a drunkard doesn’t get his drink, he will die? DR. SINGH: No, but if a man doesn’t eat, he will die. PRABHUPADA:That’s also not a fact. Last night we were discussing Raghunatha dasa Gosvami. In his later life, he almost completely abstained from eating and sleeping. He would drink only a little buttermilk every three or four days, and he worked twenty—two hours a day, sleeping two or three. And some days he did not sleep at all. So you may ask, “How could he survive?” Actually, he lived for one hundred years. Eating, sleeping, mating and defending were not problems for Raghunatha dasa Gosvami, but still he lived. Because he was a pure devotee of Krishna, he was fully aware that the soul is eternal and independent, although it has been put into this bodily cage, which it actually does not require. Suppose a bird is encaged. Is he living simply because he is in the cage? Without the cage he is free. People are thinking that by being encaged within the body they are happy. That is nonsense. Actually, our encagement within this body makes us fearful. But as soon as we purify our existence—we do not even have to come out of our bodies—we will immediately be abhaya, fearless. Lord Krishna says, “One who is thus transcendentally situated at once realizes the Supreme Brahman and becomes fully joyful. He never laments nor desires to have anything; he is equally disposed to every living entity. In that state he attains pure devotional service unto Me.” We can immediately awaken to our original, spiritual existence, in which there is no more fear, no more lamentation, and no more material desire. DR. SINGH: But the scientist would still want some more explanations as to how the living entity can be independent of matter. PRABHUPADA:As long as you are conditioned, you are dependent on matter. For example, a man from Africa is conditioned because he cannot tolerate this cold weather. Therefore he feels discomfort. But there are many people here [gesturing toward children playing on the beach] who are not affected by the cold. The ability to tolerate is simply a question of conditioning. When you are conditioned, you think in terms of dualities like hot and cold, pain and pleasure. But when you are liberated, you have no such conditioned thoughts. Spiritual life means to become unconditioned—to come to the brahma-bhuta stage. [Srimad-Bhagavatam 4.30.20] That is the perfection of life. Being conditioned means that although the living entity is eternal, due to his conditioning he thinks that he is born, he is dying, he is diseased and he is old. But an unconditioned person is not even old. 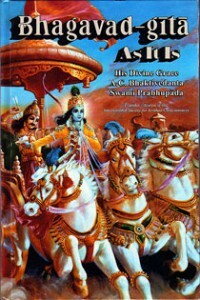 Krishna is described in the Brahma-samhita as advaitam achyutam anadim ananta rupam adyam purana-purusham nava-yauvanam cha [Bs. 5.33]. This means that He is the oldest person, the first person, but that He has no old age. He always appears just like a young man of twenty because He is fully spiritual.